Daneshvar, S., Behrooz, R., Kazemi Najafi, S., and Mir Mohamad Sadeghi, G. (2019). "Characterization of polyurethane wood adhesive prepared from liquefied sawdust by ethylene carbonate," BioRes. 14(1), 796-815. Polyols, which are important compounds of polyurethane adhesives (PU), were prepared in this work from renewable sources. Beech wood sawdust was liquefied using ethylene carbonate as a new solvent and sulfuric acid as a catalyst in the two phases. The first phase of the liquefaction process was carried out at temperatures 110 to 160 °C, and the catalyst content was studied in the second phase. The biopolyol was used for two types of polyurethane adhesive by blending two types of isocyanate, poly4,4′- diphenyl methane diisocyanate (PMDI) and toluene diisocyanate (TDI), in different NCO/OH ratios for the preparation of polyurethane adhesives. Liquefaction temperature had a great influence on the characteristics of polyol such as acid and hydroxyl numbers and yield. Moreover, the polyol obtained at 130°C and 120 min with yield 85% was found to be a suitable polyol for preparing polyurethane adhesives. By increasing the molar ratio (NCO/OH) to 1.7, the lap shear strength was increased. The optimal lap shear strengths in PU PMDI and PU TDI were 1.64MPa and 1.46MPa, respectively. FTIR results showed that due to the presence of hydroxyl groups (OH), beechwood sawdust can be a source of polyol. Urethane bonds can form between the polyol and isocyanate in polyurethane adhesives. Because lignocellulosic wastes are abundant, widely available, and renewable, the possibility of using them as a new lignocellulosic source has generated much interest (Chen et al. 2012). Due to the declining availability of fossil fuels, in addition to environmental concerns, renewable sources such as agricultural wastes and wood waste have been used for the production of biopolyol (Kong et al. 2011). Abundant lignocellulosic wastes are available from hardwood forests in the north of Iran. More than 30 percent of the forest cover consists of Fagus orientalis (beech) species; thus, a large amount of this raw material could be used in the preparation of biopolyol (Hassani et al. 2015). Lignocellulosic materials from agricultural and forestry residues are primarily composed of cellulose, hemicellulose, and lignin. The polysaccharide components (cellulose and hemicelluloses) each contain two or three hydroxyl groups per monomer unit (Chen et al. 2012; Zhang et al. 2012). The hydroxyl groups are important sites for reaction in many chemical modifications and production of many polymers such as polyurethane, etc. 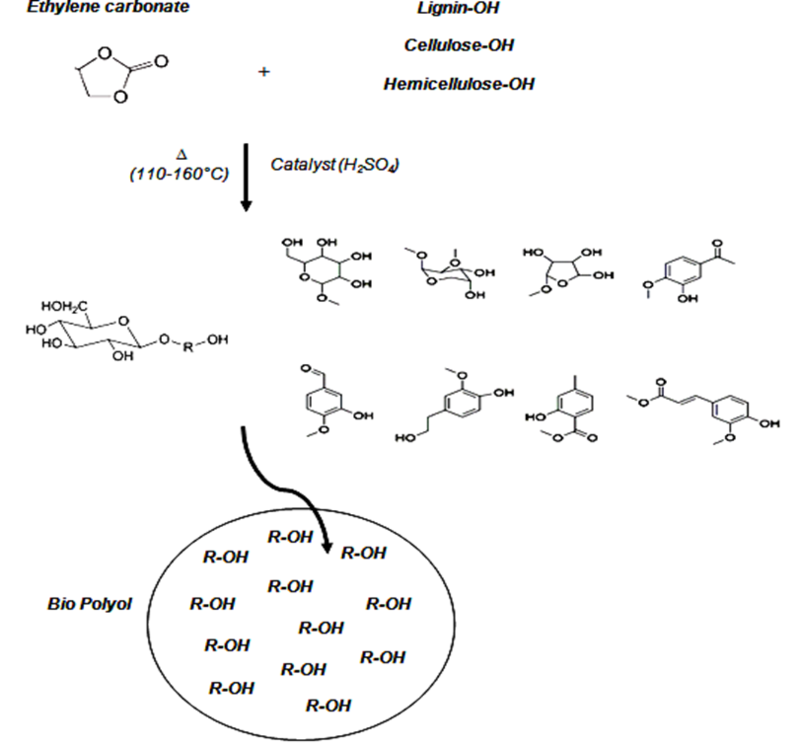 Recently, liquefaction processes for the complete conversion of lignocellulosic material into liquid products have been developed using solvents such as polyhydric alcohols [ethylene glycol (EG), polyethylene glycol (PEG), crude glycerol and glycerin] and cyclic carbonate [ethylene carbonate (EC) and propylene carbonate (PC)] in the presence of an acid catalyst under atmospheric conditions (Ono et al. 1996; Yamada and Ono 1999; Liang et al. 2006; Hu et al. 2012, 2014; Hu and Li 2014). To reduce the production cost of polyols and the preparation of polyurethane foam and adhesive, researchers have used crude glycerol as the liquefaction solvent of lignocellulosic biomass, (Hu et al. 2012; Hu and Li 2014; Cui et al. 2017; Rastegarfar et al. 2018). The rate of liquefaction of cellulose and hardwood with cyclic carbonates such as EC and PC is faster than that of polyhydric alcohols. The main problems of polyhydric alcohols are the low speed and need for high temperatures for the liquefaction process. Cyclic carbonates, due to their high permittivity value, have been used as effective solvents (Yamada and Ono 1999). Due to their amorphous structures and the fact that they are easily accessible to liquefaction solvents, the liquefaction of hemicellulose, lignin, and amorphous cellulose occurs rapidly during the early stages of liquefaction. 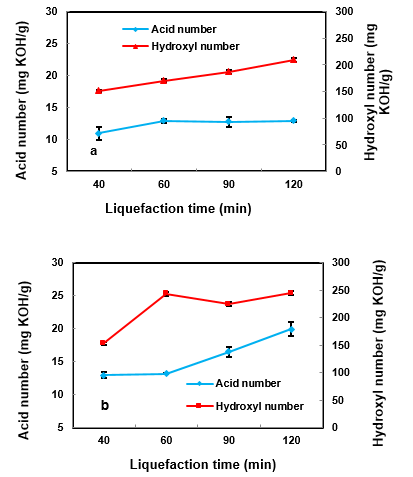 In contrast, the well-packed structure of crystalline cellulose is liquefied more slowly and continues until the latest stages of the liquefaction process (Hu et al. 2014). The hydroxyl numbers and the structure of the hydroxyl groups are key characteristics for using polyols as raw materials in the preparation of polyurethane (Yao et al. 1996). The hydroxyl number of polyols is also an important factor in the procurement of polyurethane desired mechanical properties (Ionescu 2005). Polyurethane is one of the most significant and diverse polymeric materials that Otto Bayer discovered in 1937. Industrial polyurethane is a petroleum-based polymer that is produced from a reaction between polyol and isocyanate. Polyurethane is produced in various forms such as: types of foam, film, elastomers, and adhesives (Saunders and Frisch 1962; Zhang et al. 2013). Polyurethane adhesives are some of the most important and significant polymeric materials used in industrial production. One desirable property of polyurethane adhesives is its resistance against chemical materials, moisture, and temperature. In addition, polyurethane adhesives are preferable to other adhesives such as phenol and urea formaldehyde due to their low toxicity and the little danger posed to human health. This is because PF and UF adhesives are not resistant to hydrolysis and they emit formaldehyde, which is a gas that is dangerous for human health. However, some notable disadvantages exist for PU adhesives such as the inherent toxicity of isocyanate and its fire hazards at high temperature (Saunders and Frisch 1962; Desai et al. 2003; Somani et al. 2003). The resistances of polyurethane adhesives (chemical, mechanical, and physical) are determined by their formulations. Generally, polyurethane adhesives are produced by reacting polyol and isocyanate in the presence of effective additives such as a catalyst and glycerol as cross linker, etc. (Phetphaisit et al. 2013; Khoon Poh et al. 2014). Usually, isocyanates containing NCO groups used in polyurethane adhesives production industries are 2,4 and 2,6 toluene diisocyanate (TDI) and poly 4,4 diphenyl methane diisocyanate (PMDI). The NCO/OH ratio in adhesive formulation has the greatest effect on adhesive strength characteristic. When the NCO/OH ratio in the polyurethane adhesives is higher than 1, adhesive bonding strength due to perfect reaction between (OH) polyol and (NCO) isocyanate and formation of a urethane bond will be increased. The adhesive bonding strength is evaluated by using lap shear strength (Khoon Poh et al. 2014). The catalyst that is commonly used in the production of polyurethane adhesives is dibutyltindilaurate (DBTL). Catalysts are used as reaction accelerators and gel time reducers in consumable adhesives. Glycerol is a simple polyol compound that has three hydroxyl groups that are responsible for reactions with isocyanate and increased adhesives bonding strength (Mishra 2010; Khoon Poh et al. 2014). At the present time, commercial polyurethane adhesives are prepared from a reaction between petroleum-based polyol and diisocyanate. In recent decades, due to a decrease in fossil resources and environmental concerns, lignocellulose resources are increasingly used for the production of polyol and polyurethane adhesives. As above mentioned, beech wood was selected for this study due to its regional availability and considerable application in most wood industries in Iran. Therefore, high quantities of beech wood waste produced, and these can be converted into valuable products such as polyols. Studies on the liquefaction of beech wood with different solvents has been conducted by researchers with different conditions, but only the yield of liquefaction is considered as an indicator. The purpose of this study was liquefaction of beech wood sawdust by using ethylene carbonate as a solvent and the preparation of polyurethane wood adhesive by using the liquefied product for wood adhesion. 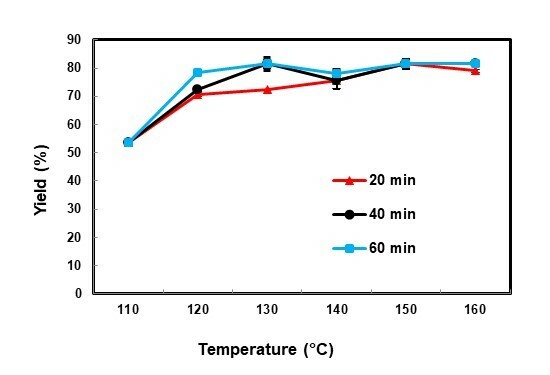 In this regard, the effect of temperature, time, and amount of catalyst have been determined to the optimal conditions for suitable polyol to the preparation of polyurethane adhesive. Furthermore, the properties of polyol and polyurethane wood adhesive were evaluated. Beech wood sawdust was used as lignocellulosic raw material, with a particle size that passed through a 60-mesh screen. The sawdust was dried in an oven at 105 °C overnight before use. The composition of feed stock (beech wood) such as cellulose, lignin, ash and extractive material are almost 49.8%, 31%, 2%, and 4.33%, respectively (Hassani et al. 2015). Ethylene carbonate was used as a solvent and sulfuric acid as a catalyst in the liquefaction. Both were purchased from Merck (Darmstadt, Germany). The PMDI and TDI were used as isocyanate compounds. As for the polyurethane adhesive preparation, glycerol and dibutyltindilaurate were purchased from Merck (Darmstadt, Germany). Beech wood (Fagus orientalis) was used for the lap shear test. The experimental method adopted was as described by Xie and Chen (2005): 32.5g of liquefying reagent as solvent and 0.97g catalyst (3 wt% for the liquefying reagent) were added to a three-neck flask (250 mL), which was equipped with a stirrer, thermometer, and reflux condense. Then the flask was immersed in a silicon oil bath that had been preheated. The temperature then was raised to a desired level. Next, 6.5 g of beech sawdust was added to the flask. The mixture was continuously stirred to obtain a homogeneously liquefied product during the liquefaction process. For all experiments, the liquefaction process was conducted at different temperature levels (110 to 160°C) and over three reaction times (20, 40, and 60 min) under ambient pressure. After the set time, the flask was immersed in cold water to quench the reaction. Schematically, Fig. 1shows the preparation of polyol from beech wood sawdust by using the liquefaction process with ethylene carbonate of solvent. The liquefied product was diluted by a universal diluent, 1, 4-dioxane, in excess of 80%. The residue was separated with a glass filter and after that rinsed thoroughly with dioxane and oven dried at 105 °C for 24 h. The residue content and yield percent were calculated by Eq. (1) and (2) (Desai et al. 2003). where C is the volume of NaOH standard solution at the equivalence point(ml); Bis the volume of blank solution(ml); W is the sample weight(g), and N is the equivalent concentration of NaOH standard solution (mol/L). where B is the volume of blank solution (mL); S is the volume of NaOH standard solution required for titration (mL); W is the sample weight (g); N is the equivalent concentration of NaOH standard solution (mol/L). 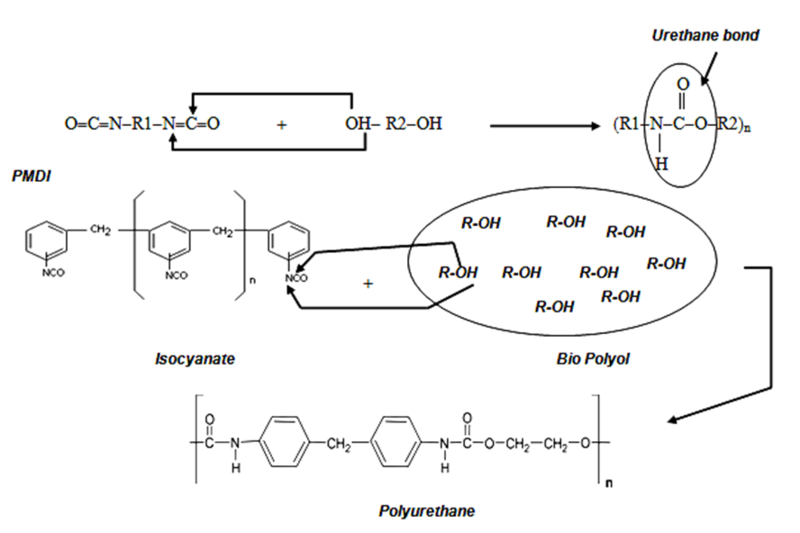 Synthesis of polyurethane wood adhesives was carried out by a reaction of polyol with two types of diisocyanate (PMDI and TDI), as shown in Fig. 2. The polyol, glycerol as a cross-linker (1, 2, 3, 4, 5%), and dibutyltindilaurate (DBTL) as a catalyst (0.1, 0.2, 0.3, 0.4, 0.5%) were mixed together and stirred at 400 rpm with a stirrer for approximately 3 min at room temperature. Then isocyanate adducts were added to the mixture, and the preparation of adhesive continued at the same speed for 3 min. The polyurethane wood adhesive was applied with a brush onto wood surfaces, and then the attached samples were cured at room temperature for 24 h. The polyurethane adhesives were prepared by using two types of diisocyanate: polymeric 4,4′-methylene diphenyl diisocyanate (PMDI) and toluene diisocyanate (TDI). The polyurethane adhesives were prepared by a NCO/OH ratio of (0.7 to 1.7) and then compared together (Khoon Poh et al. 2014). Optimization of the catalyst and glycerol suitable values added to polyurethane adhesive were carried out by using DESIGN EXPERT 7 (Stat-Ease Inc., Minneapolis, USA) software. The formulation of PU adhesives is shown in Table 1. According to ASTM D906-98 (2003), the beech wood pieces were converted into strips at 25×300×3mm3 and then prior to application were polished with sand paper (Desai et al. 2003). Lap shear strength tests were carried out according to ASTM D906-98 (2003). The adhesive was applied onto the surface of the wood in a bonding section of 30 × 25 mm2. The application rate of the adhesive onto the beech wood surface bonding area was 0.2 mg/mm2. Then two surfaces of wood were placed together under pressure of 2.5 kg at room temperature for 24 h. The prepared samples were conditioned at 25 °C and relative humidity of 50% ± 5% for 7 days. The lap shear strength of the wood samples was determined by the SANTAM model STM-20 (Tehran, Iran) and was pulled at a rate of 5 mm/min (Somani et al. 2003). For the investigation of the chemical resistance of both types of polyurethane adhesives (PMDI PU and TDI PU), polyurethane-adhesive-bonded wood samples [molar ratio (NCO/OH:1.7) that have higher lap shear strength] were treated under four conditions: cold water (30 °C) for 24 h, boiling water for 1 h, acidic solution (pH 2) at 80 °C for 1 h, and alkaline solution (pH 10) at 80 °C for 1 h. Then wood samples, prior to lap shear strength measurement, were dried for 24 h at 30 °C and relative humidity of 50% ± 5% (Desai et al. 2003; Somaniet al. 2003; Khoon Poh et al. 2014; Najafi Moghadam et al. 2016). One important factor for an adhesive is green strength. This property is the strength measured or ability of an adhesive to hold the substrates together before the complete curing of the adhesive for the achievement of ultimate strength. This property was carried out for wood samples using lap shear strength tests at regular intervals (days) (Somani et al. 2003; Najafi Moghadam et al. 2016). Gel time or pot life is the maximum time during which the system remains in a ﬂuid state for use. The flow behavior of polyurethane adhesive was checked manually using a glass rod at room temperature (Desai et al. 2003). Fourier-transform infrared spectroscopic analysis was performed using an AVATAR model instrument (Thermo Electron Corporation, Waltham, MA, USA). 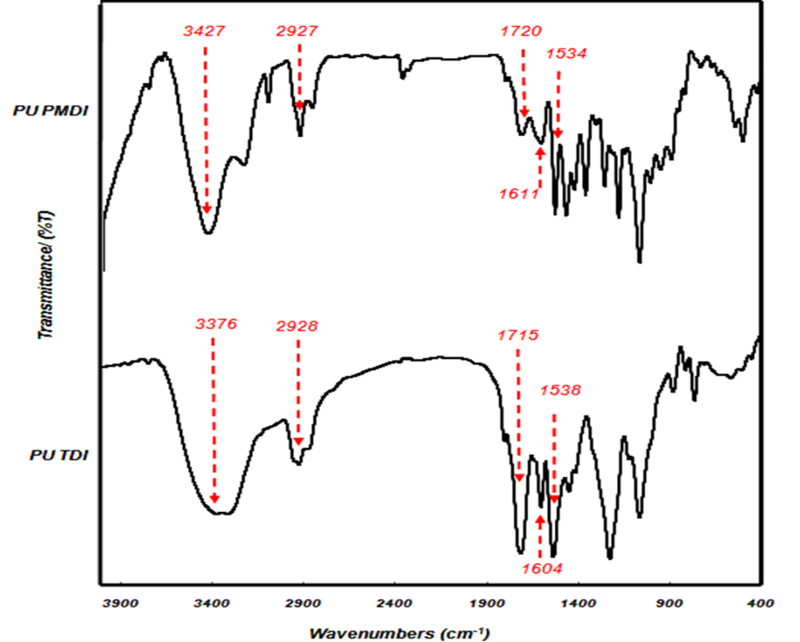 Spectral data in the range between 400 and 4,000 cm-1 were collected averaging 40 scans at a resolution of 4 cm-1. Transmittance measurements were conducted using the KBr pellet method. Thermogravimetric analysis for both of types PU adhesives (PU PMDI and PU TDI) was performed on according to ASTM D3850-94 (2006) using Model Q600 (TA Instruments, New Castle, DE, USA) at a heating rate of 10 °C/min under nitrogen flow, in the range of 30 to 700 °C. In this study, SPSS software and one-way ANOVA were used to analyze the data. Each data represents the average of five experiments. The liquefaction process of beech wood sawdust with ethylene carbonate solvent and catalyst value 3% (sulfuric acid) was carried out at different temperatures and times for producing the polyol. Table 2 shows the characteristics of the obtained polyols. The effect of the liquefaction process variables, including temperature and reaction time, on the residue content and yield are shown in Fig. 3. For all reaction times, by increasing the temperature from 110 to 160 °C the yield reached from 53.8% to about 80%. In other words, the temperature can increase the degradation of lignocellulosic material. Beech sawdust at a low liquefaction temperature is decomposed slowly, so the residue content is decreased gradually, but at high temperatures the rate of degradation increases. Yamada and Ono (1999) and Liang et al. (2006) found that the rate of degradation of ethylene carbonate is almost 30 times faster than other solvents such as polyhydric alcohols, which can lead to greater liquefaction yields. In this study, the residue content at 110°C and 40 min (46.2%) was higher than at 160°C (18.5%). Furthermore, as can be seen in Fig. 3, by extending the reaction time from 20 to 60 min the residue content decreased. In this case, Yamada and Ono (1999) and Xie and Chen (2005) found that liquefaction at the higher temperature was carried out more quickly. The liquefaction process of hemicelluloses, lignin, and amorphous cellulose occurs quickly due to amorphous structures and more convenient accessibility of solvents. In contrast, the crystalline part of cellulose has a well-packed structure and less availability of the liquefaction solvent (Hu et al. 2014). Therefore, extending the time of the liquefaction process creates more decomposition to beech sawdust. 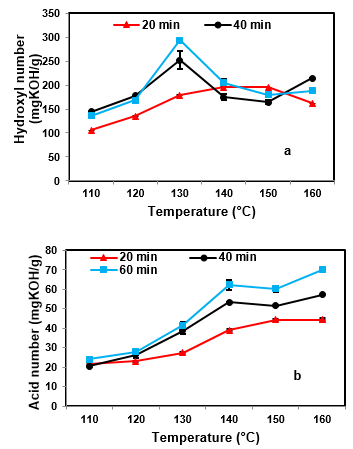 Figure 4 shows the relationship between liquefaction temperature and the hydroxyl and acid number of liquefied products of beech wood sawdust. For all reaction times, by increasing the temperature from 110 to 160 °C the acid number increased, but the hydroxyl number increased at first, then decreased. 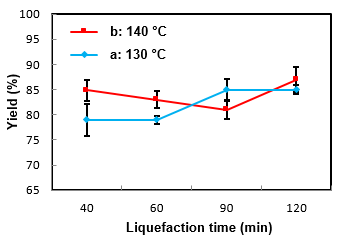 Furthermore, Table 2 shows that the effect of the solvent on lignocellulosic material was increased by extending the liquefaction temperature and time. As a result, the reactions between EC and the lignocellulosic components such as cellulose, hemicelluloses, and lignin accelerate. Lee et al. (2000) found that increases in the acid number of the liquefied products (polyol) during the liquefaction process are mainly because of oxidation of the polysaccharides or depolymerization of the wood component. Furthermore, other researchers found that the decrease in the hydroxyl number of polyol with increasing temperature is because of thermal oxidation and the dehydration of the liquefying reagent and the reaction between the liquefied reagent and the sawdust components (Yao et al. 1996; Zhang et al. 2012). According to the characterization of liquefied products in the first phase, the liquefaction process is not suitable at low or high temperatures. The liquefied products obtained at low temperatures have low hydroxyl numbers and yields and at high temperatures have low hydroxyl numbers and high acid numbers. Hydroxyl groups of the polyols are functional groups in polyurethane production and the strength of polyurethane products depends on the hydroxyl value and the acid number of polyol. Therefore, the liquefaction process for study in the second phase was carried out at the two intermediate temperatures of 130 and 140 °C. In this phase, to reduce the acid number and production of suitable polyol for the preparation of polyurethane adhesive, the catalyst value was decreased from 3% to 1.5%. This was done because with catalyst value 3%, the acid number of polyol was very high, which is not suitable for the preparation of polyurethane adhesive. Also in this phase, the effects of reaction time were investigated to determine how to achieve better polyol properties. Table 3 and Fig. 5 show the acid and hydroxyl number values at two temperatures of 130 and 140 °C and at different times with 1.5% catalyst. According to the obtained results, the acid number values with decreased catalyst dosage of 1.5% noticeably decreased. As can be seen in Fig. 5, when the reaction time was set to 120 min, the acid and hydroxyl number also increased. These results suggest that the increases in acid numbers of the polyol of wood sawdust during the liquefaction process are mainly because of oxidation of the polysaccharides or depolymerization of the wood components (Zhang et al. 2012). An increase in the hydroxyl number is usually due to the cleavage of the ether linkage of lignin and cellulose units (Xie and Chen 2005). Table 3 and Fig. 6 show the effects of the liquefaction time on the yield and residue content. With the progress of the reaction times the residue content decreased because of the effects of EC solvent on wood sawdust components and degradation of the macromolecules of sawdust, converting them into soluble components. According to obtained results in the second phase between 130 and 140 °C, it can be concluded that treatment at 130 °C and 120 min is more suitable for the production of polyols and polyurethane adhesive, because of the lower acid numbers and higher hydroxyl numbers and yields than at 140 °C. Although treatment at 140 °C has slightly similar results to results at 130 °C, reducing energy consumption in the industry is a significant issue. The IR spectrum of the beech wood sawdust and polyol are shown in Fig. 7. The spectra of wood sawdust show that a strong broad OH stretching at 3411 cm-1 and C-H stretching in methyl and methylene groups (2854 to 2926 cm-1). The peak at 1738 cm-1 belongs to C=O stretching in acetyl groups of hemicelluloses and at 1427 cm-1 belongs to aromatic skeletal vibration combined with CH2 symmetrical bending mode of hydroxymethyl in crystalline cellulose and a-C-O- stretching band at 1248 cm-1, which confirmed the formation of ester bonds (Bodirlau and Teaca 2009; Meilan et al. 2014). Furthermore, the spectrum of polyol shows that the widespread peak at 3340 cm-1 corresponds to the –OH stretching vibration. The peak at 2869 cm-1 corresponds to a CH stretching vibration. In addition to these aromatic bands, a strong band at 1720 cm-1 corresponding to carbonyl groups was observed. The peak at 1450 cm-1 corresponds to a C=C stretching caused by aromatic structure (Yamada and Ono 1999). The peaks of 3300 and 3500 cm-1 in both sample belong to OH groups. The hydroxyl groups are important sites for reaction in many chemical modifications and production of many polymers such as polyurethane (Ono et al. 1996). Figure 7 clearly shows that the peak at 1427 cm-1 corresponding to wood sawdust decreased in the liquefied sample (polyol). The liquefaction process has the ability to convert wood sawdust into substances that are soluble. Amorphous and crystalline structures of wood sawdust during the liquefaction process could be converted into small components with a large number active hydroxyl groups appropriate for chemical reaction. This polyol (liquefied product) could be used in the production of polyurethane adhesives (Hu et al. 2014). Researchers found that hardwoods, due to presence of xylan content in their structural composition, show a stronger carbonyl band at 1740 cm-1. Beech wood sawdust, due to the presence of xylan content, shows a carbonyl band at 1738 cm-1. This wavenumber for the liquefied sample (polyol) shifted to a lower value (1720 cm-1). 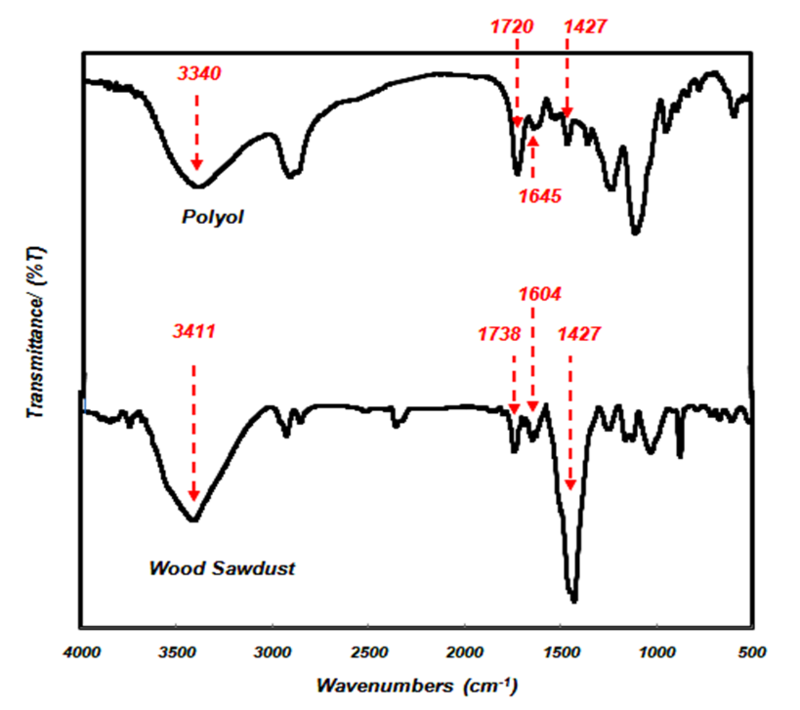 The appearance of the band at 1604 cm-1 in the liquefied sample (polyol) and 1645 at cm-1 in wood sawdust shows the existence of a large amount of metoxyl groups in heartwood (Bodirlau and Teaca 2009). For preparation, adhesives were used from polyol (130 °C, 120 min), isocyanate (PMDI, TDI), and glycerol as cross linkers and DBTL as catalyst. Glycerol and catalyst (DBTL) values were obtained by using RSM for PU PMDI (1.56%, 0.11%) and PU TDI (3.12%, 0.34%), respectively. The average lap shear strength for both type of adhesives (PU PMDI and PU TDI) is shown in Table 4. According to the obtained results, an increase in the NCO/OH ratio from 0.7 to 1.7 in the both types of adhesives increased the lap shear strength. At a low NCO/OH ratio, sufficient free NCO groups for reaction with OH groups of polyol did not exist, and for this reason the bond strength was reduced between wood and adhesive. Also, at a low NCO/OH ratio there was not a sufficient amount of NCO groups of isocyanate to react with the wood. On the other hand, all of the NCO groups of isocyanate reacted with OH group of polyol to form urethane. As a result, the reason for failure was the cohesive failure (CF). At a higher NCO/OH ratio, the lap shear strength was increased due to the increase of free NCO groups of isocyanate. On the other hand, with the addition of excess isocyanate to the adhesive mixture created more reactions between NCO groups and OH groups, which led to an increase the cross-linking density due to the formation of urethane bonds as well as formation adhesives with higher mechanical properties. Moreover, excessive NCO groups can increase the reaction of isocyanate with hydroxyl groups of woods; thus free NCO groups penetrate into the wood’s top layer, leading to an increase in the adhesion force between the adhesives and the substrates (woods). Table 4 shows that a NCO/OH ratio of 1.7 in PU TDI and 1.5, 1.7 in PU PMDI with an additional excess of isocyanate failed due to the cohesive failure (CF) and substrate failure (SF) (Desai et al. 2003; Khoon Poh et al. 2014; Najafi Moghadam et al. 2016). As shown in Table 4, the average lap shear strength in PU PMDI was higher than PU TDI because diisocyanate (PMDI) has a linear structure whereas diisocyanate (TDI) has a ring structure. Diisocyanate with a linear structure is more easily connected to OH groups (Somani et al. 2003; Mishra 2010). The highest value of average lap shear strength in both types of adhesives was obtained at a NCO/OH ratio 1.7. This molar ratio was considered for continuing the study on adhesives properties. The chemical resistance of the adhesives (PU PMDI and PU TDI) with a NCO/OH ratio 1.7 is shown in Table 5. The results show that both types of adhesives were resistant to cold and hot water but lap shear strength in the acidic (pH 2) and alkaline (pH 10) conditions was slightly decreased, because the polyester polyols were easily hydrolyzed under acidic conditions. Moreover, hydrolysis under alkaline conditions and extraction of lignin from wood led to reduced lap shear strength in both adhesives (Somani et al. 2003). The curing properties of the adhesives PU PMDI and PU TDI were obtained by using lap shear strength tests at regular intervals (days) (Fig. 8). According to Fig. 8, the average lap shear strength of adhesives PU PMDI and PU TDI had the highest value on day 30. On the other hand, the adhesives curing and increase in the mechanical strength continued to day 30. The average lap shear strength in the polyurethane adhesives was obtained in range of 1.561 MPa for PU PMDI and 1.49 MPa for PU TDI (Somani et al. 2003; Khoon Poh et al. 2014; Najafi Moghadam et al. 2016). Gel time is one of the important parameters in preparation adhesives. Determination of optimal gel time for the application of adhesives is very significant because represents usability of adhesive during work. In the event of decrease or increase at this time, the adhesion strength will changed and there is a probability the reducing of adhesive bond strength. 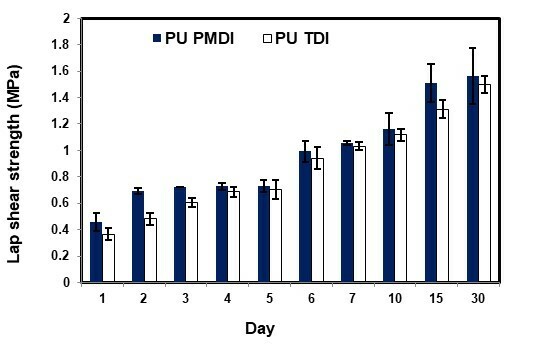 Figure 9 shows the effects of the NCO/OH ratio on the gel time for the adhesives PU PMDI and PU TDI. As Fig. 9 shows, by increasing the NCO/OH ratio from 0.7 to 1.7 the gel time of adhesives was decreased. A high NCO/OH ratio can form more crosslink between NCO groups of isocyanate and OH groups of polyol. The formation of more crosslink during the preparation of adhesives reduces the gel time of adhesives (Desai et al. 2003). Figure 10 shows FTIR spectra of both cured types of adhesives (PU PMDI and PU TDI) with a NCO/OH ratio of 1.7. The peaks resulting from –NH stretching and bending vibrations (urethane) were observed at 3427 and 1534 cm-1 for PU PMDI and 3376 and 1538 cm-1 for PU TDI, respectively. The carbonyl groups were observed at 1720 and 1715 cm-1 in PU PMDI and PU TDI, respectively. The peaks resulting from C-H stretching of methylene and methyl groups in the soft segments were observed at 2859 and 2927 cm-1 for PU PMDI and PU TDI, respectively. The bands observed at around 1611 and 1604 cm-1 for PU PMDI and PU TDI, respectively, correspond to conjugated double bonds in the aromatic ring of the hard segment. The appearance of this band confirms the reaction of OH polyol with NCO isocyanate. The preparation of polyurethane adhesives and the formation of urethane bands are mainly identified by the absence of OH groups and the appearance of NH bands (Somani et al. 2003; Khoon Poh et al. 2014; Najafi Moghadam et al. 2016). 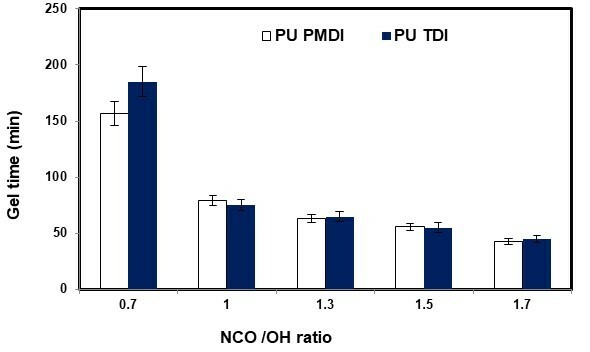 Figure 11 shows the thermal properties of PU PMDI and PU TDI with a NCO/OH ratio of 1.7. The initial weight loss in both adhesives (PU PMDI and PU TDI) at 100°C is due to evaporation of water in the system and the release of volatile substances. The first stage of decomposition (10% weight loss) occurred between 230 and 238°C in PU PMDI and PU TDI, respectively, due to the decomposition of urethane bonding which led to the formation of CO2, alcohols, amines, aldehydes, CO, etc. (Jellinek and Dankle 1983). The second stage of decomposition (50% weight loss) occurred at 393 and 337°C in PU PMDI and PU TDI, respectively, due to decomposition of the hard segments of isocyanate. The third stage (90% weight loss) occurred at 680 and 622 °C in PU PMDI and PU TDI, respectively, due to the decomposition of lignin or the char formed in during thermal degradation (Khoon Poh et al. 2014; Najafi Moghadam et al. 2016). 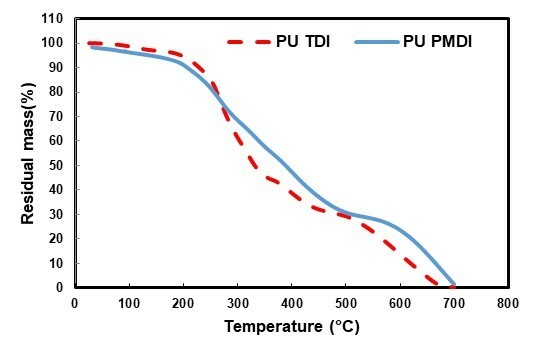 Figure 11 shows that the thermal stability of PU PMDI is higher than that of PU TDI, because the thermal stability of diisocyanate with a linear structure is greater than that of diisocyanate with a ring structure (Somani et al. 2003; Khoon Poh et al. 2014). 1. A fast liquefaction process of beech sawdust in the presence of sulfuric acid under atmosphere pressure was achieved by using ethylene carbonate as a liquefying reagent. 2. The catalyst content exhibited great influence on the residue content, acid, and hydroxyl numbers. With a high value catalyst, the liquefied products had high acid numbers and residue contents and low hydroxyl numbers. 3. Evaluation of the PU adhesives prepared with PMDI and TDI in the different NCO/OH ratios showed that an NCO/OH ratio of 1.7, due to formation of higher urethane bonds and higher cross-linking density, had the highest lap shear strength compared to other molar ratios. Furthermore, the results of chemical resistance of both polyurethane adhesives show that these adhesives were resistant to cold and hot water but not very resistant to acidic and alkaline conditions. Furthermore, the green strength and curing time of the both adhesives reached the highest value on day 30. 4. FTIR results showed the presence of the hydroxyl groups (OH) in the liquefied beech sawdust and confirmed that liquefied wood sawdust prepared at 130 °C and 120 min is a source of polyols and a potential chemical stock for the synthesis of polyurethane adhesives. Moreover, urethane bonds in polyurethane adhesives formed between the polyol and isocyanate. 5. Finally, TGA analysis showed that the PU PMDI had better thermal stability than the PU TDI. The authors are grateful for the support of Wood and Paper Science and Technology Department of Tarbiat Modares University. ASTM D3850-12 (2006). “Standard test method for rapid thermal degradation of solid electrical insulating materials by thermogravimetric method (TGA),” ASTM International, West Conshohocken, PA.
ASTM D4274-05D (2012). “Standard test methods for testing polyurethane raw materials: Determination of hydroxyl numbers of polyols,” ASTM International, West Conshohocken, PA.
ASTM D4662-08 (2012). “Standard test methods for testing polyurethane raw materials: Determination of acidity as acid number of polyols,” ASTM International, West Conshohocken, PA.
ASTM D906 (2003). “Standard test methods for strength properties of adhesives bond in shear by compression loading,” ASTM International, West Conshohocken, PA.
Bodirlau, R., and Teaca, C.A. (2009). “Fourier transforms infrared spectroscopy and thermal analysis of lignocellulose fillers treated with organic anhydrides,” Rom. J. Phys. 54(1-2), 93-104.DOI: 10.1.1.575.5877. Chen, H. Z., Zhang, Y. Z., and Xie, S. P. (2012). “Selective liquefaction of wheat straw in phenol and its fractionation,” Appl. Biochem. Biotech. 167(2), 250-258. DOI:101007/s12010-012-9675. Cui, S., Luo, X., and Li, Y. (2017). “Synthesis and properties of polyurethane wood adhesives derived from crude glycerol-based polyols,” Int. J. Adhes. Adhes. 79, 67-72. DOI: 10.1016/j.ijadhadh.2017.04.008. Desai, S., Emanuel, A., and Sinha, V. (2003). “Biomaterial based polyurethane adhesive for bonding rubber and wood joints,” J. Polym. Res. 10(4), 275-281. DOI:10.1023/B:JPOL.0000004630.77120. Hassani, S., HosseiniHashemi, S. Kh., Farsi, R., and JahanLatibari, A. (2015). “Identification and comparison of oil compounds derived from pyrolysis of beach sound wood and decayed wood using Gas Chromatography and Mass Spectrometry (GC/MS),” Iran. J. Wood Pap. Sci. Res. 30(2), 243-255. Hu, S., Wan, C., and Li, Y. (2012). “Production and characterization of biopolyols and polyurethane foams from crude glycerol based liquefaction of soybean straw,” Bioresource Technol. 103(1), 227-233. DOI: 10.1016/j.biortech.2011.09.125. Hu, S., Luo, X., and Li, Y. (2014).“Polyols and polyurethanes from the liquefaction of lignocellulosic biomass,” ChemSusChem 7(1), 66-72.DOI:10.1002/cssc.201300760. Hu, S., and Li, Y. (2014). “Two-step sequential liquefaction of lignocellulosic biomass by crude glycerol for the production of polyols and polyurethane foams,” Bioresour Technol. 161, 410-415. DOI: 10.1016/j.biortech.2014.03.072. Ionescu, M. (2005). Chemistry and Technology of Polyols for Polyurethanes, Rapra Technology Ltd., Shrewsbury, UK. Jellinek, H. H. G., and Dankle, S. R. (1983). Degradation and Stability of Polymers, Elsevier Publication, London, UK. Khoon Poh, A., Choy Sin, L., Sit Foon, C., and Cheng Hock, C. (2014). “Polyurethane wood adhesive from palm oil-based polyester polyol,” J. Adhes. Sci. Technol. 28(11), 1020-1033. DOI: 10.1080/01694243.2014.883772. Lee, S. H., Yoshioka, M., and Shiraishi, N. (2000). “Liquefaction of corn bran (CB) in the presence of alcohols and preparation of polyurethane foam from its liquefied polyol,” J. Appl. Polym. Sci. 78(1), 319-325. DOI: 10.1002/1097-4628. Liang, L., Mao, Z., Wan, C., Wang, T., and Zhang, L. (2006). “Liquefaction of crop residues for polyol production,” BioResources 1(2), 248-256. DOI: 10.15376/biores.1.2. Meilan, A. C., Goodman, A., Baron, M., and Rodriguez, J. G. (2014). “A specific case in the classification of woods by FTIR and chemo metrics: Discrimination of Fagales from Malpighiales,” Cellulose 21(1), 261-273.DOI: 10.1007/s10570-013-009. Mishra, D. (2010). “Eco-economical polyurethane wood adhesives from cellulosic waste: Synthesis, characterization and adhesion study,” Int. J. Adhes. Adhes. 30(1), 47-54. DOI: 10.1016/j.ijadhadh.2009.08.003. NajafiMoghadam, P., Yarmohamady, M., Hasanzadeh, R., and Nuri, S. (2016). “Preparation of polyurethane wood adhesives by polyols formulated with polyester polyols based on castor oil,” Int. J. Adhes. Adhes. 68(1), 273-282. DOI:10.1016/j.ijadhadh.2016.04.004. Phetphaisit, C. W., Bumee, R., Namahoot, J., Ruamcharoen, J., and Ruamcharoen, P. (2013). “Polyurethane polyester elastomer: Innovative environmental friendly wood adhesive from modiﬁed PETs and hydroxyl liquid natural rubber polyols,” Int. J. Adhes. Adhes. 41(1), 127-131. DOI:10.1016/jijadhadh.2012.11.007. foams prepared from liquefied sawdust by crude glycerol and polyethylene glycol,” Polym Res. 25, 154-162. DOI: 10.1007/s10965-018-1516-4. Saunders, J. H., and Frisch, K. C. (1962). “Part I,” in: Polyurethanes Chemistry and Technology, Wiley-Interscience, New York. Somani, K. P., Kansara, S. S., Patel, N. K., and Rakshit, A. K. (2003). “Castor oil based polyurethane adhesives for wood-to-wood bonding,” Int. J.Adhes. Adhes. 23(4), 269-275. DOI: 10.1016/S0143-7496(03)00044-7. Xie, T., and Chen, F. (2005). “Fast liquefaction of bagasse in ethylene carbonate and preparation of epoxy resin from the liquefied product,” J. Appl. Polym. Sci. 98(5), 1961-1968. DOI: 10.1002/app.22370. Yao, Y. G., Yoshioka, M., and Shiraishi, N. (1996). “Water-absorbing polyurethane foams from liquefied starch,” J. Appl. Polym. Sci. 60(11), 1939-1949. DOI:10.1002.(SICI)1097-4628. Yamada, T., and Ono, H. (1999). “Rapid liquefaction of lignocellulosic waste by using ethylene carbonate,” Bioresource Technol. 70(1), 61-67.DOI: 10.1016/S0960-8524(99)00008-5. Zhang, H. R., Ding, F., Luo, C. R., Xiong, L., and Chen, X. D. (2012). “Liquefaction and characterization of acid hydrolysis residue of corncob in polyhydric alcohols,” Ind. Crop. Prod. 39(1), 47-51. DOI:10.1016/j.indcrop.2012.02.010. Zhang, H., Luo, J., Li, Y., Guo, H., Xiong, L., and Chen, X. (2013). “Acid-catalyzed liquefaction of bagasse in the presence of polyhydric alcohol,” Appl. Biochem. Biotech. 170(7), 1780-1791. DOI:10.1007/s12010-013-0300-5. Article submitted: July 30, 2018; Peer review completed: September 17, 2018; Revised version received: October 13, 2018; Accepted: October 17, 2018; Published: December 6, 2018.